Now how's that for an opening line! It certainly got mý attention, I can tell you. Imagine yourself being stalked by a colleague from work. You don't know what you did to catch his attention, but somehow you did. And he's everywhere you turn. He's there when you wake up, he's there when you go to work, and he's there when you go home. He even knows your menstrual cycle, because he steals your garbage bags and goes through them. That's the story of Clarissa in Claire Kendal's book The Book of You. The Book of You is Clarissa's story. Clarissa is the main character of the book, and the one who is stalked by her colleague Rafe. She has read somewhere that it's important to gather as much evidence of the stalking as possible. And to keep a journal of everything that your stalker does. And that has become My Book of You. Half of the book is written in the first person perspective. The other half of the story is told from an omniscient point of view. Normally I kind of hate changing perspectives, but in this book it works! I love that this book has a clearcut storyline. There isn't much else going on in the book, except for Clarissa's story. And that's fine, because it's a story filled with suspense. I also appreciated that I didn't have to get to know all kinds of characters. It's all about Clarissa. If you're a mom like me, and your attention span is kind of short, then this is a great book. It will grab your attention, and all you have to remember is that it's about this person called Clarissa! I mean, that's doable, isn't it?! Besides which, this story really grabs you. I couldn't stop reading, wanting to find out what would happen. Summing up: The Book of You is a must-read! The Book of You is a must read! It's very well written, it's got a great storyline, and it grabs your attention. I even went to see if the author Claire Kendals has written any more books, because I want more! But this is her debut novel. And I for one can't wait for the second one. 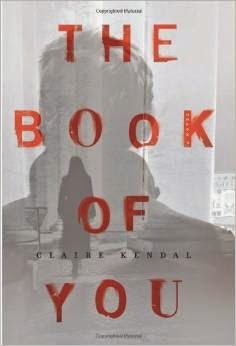 You can buy The Book of You: A Novel at Amazon.com for 16.43.